Once Coco and Lentil got used to the early weaning vegetable purees I made, I was keen to introduce fish. I wasn’t a great fish eater as a child: I only ate my mother’s fish pie which she topped with crumbled crisps and even then, I ate more of the potato and crisps than the fish! Thankfully, Coco and Lentil aren’t yet showing any signs of my fish pickiness. Salmon was the first fish they tried and one I come back to regularly. As an anadromous fish it’s great brain food, a good source of vitamin D, and, of course, it’s omega-3 properties are well publicised. It is also very versatile and can be baked, cured, eaten raw, grilled, poached, sautéed or smoked. This recipe calls for a saute pan and a little glaze. It’s yummy and healthy! You can check out our other fish recipes here. 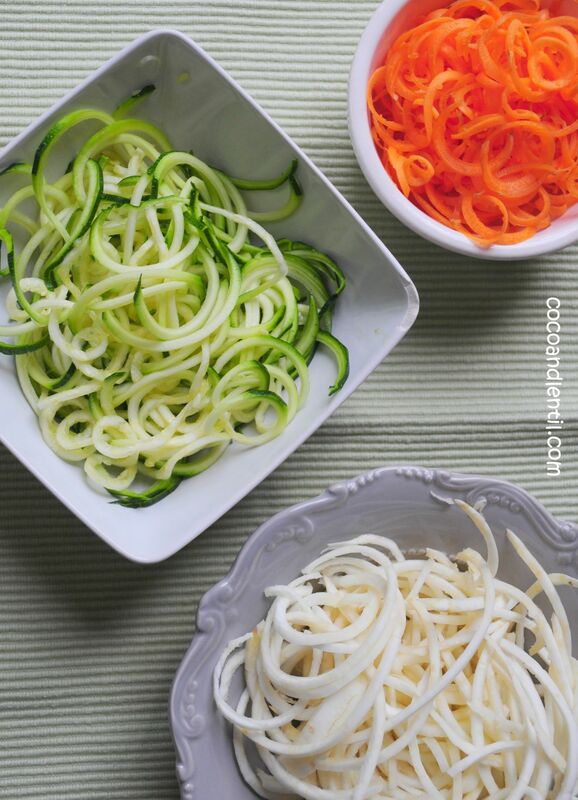 Slice the carrot, celeraic and courgette into thin vertical strips using a potato peeler, or alternatively if you have a spiralizer, slice into ribbons. You can prepare the vegetables in advance – just place in a bowl with water and refrigerate. Drain and pat dry with some kitchen towel when needed. To make the glaze mix all the ingredients together in a shallow bowl and marinade the salmon fillets for 2 minutes on each side. Meanwhile heat the olive oil in a large non-stick pan for the vegetables. Heat another dry pan for the salmon. 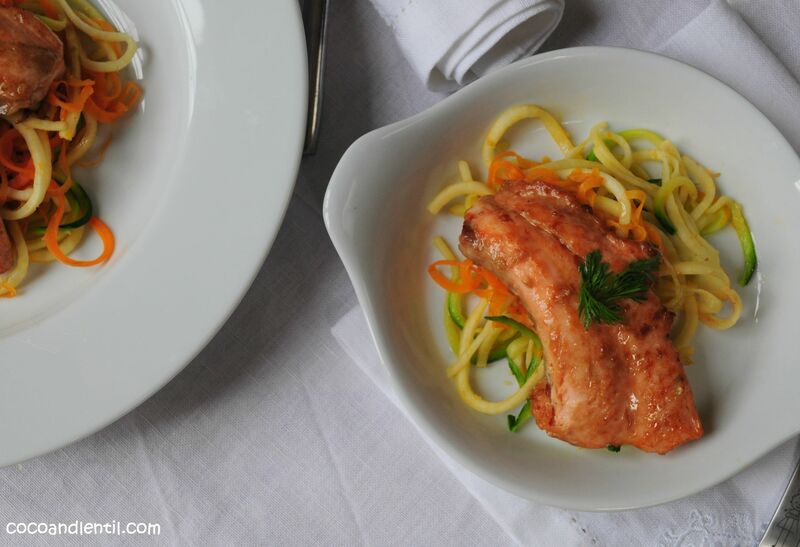 Remove the salmon from glaze (but retain the glaze for later) and add to the dry, hot pan. Cook for 2 minutes, then turn, pour over the glaze and cook for further 2 minutes. Add the spiralized vegetables to the oiled pan and cook for 2-3 minutes. 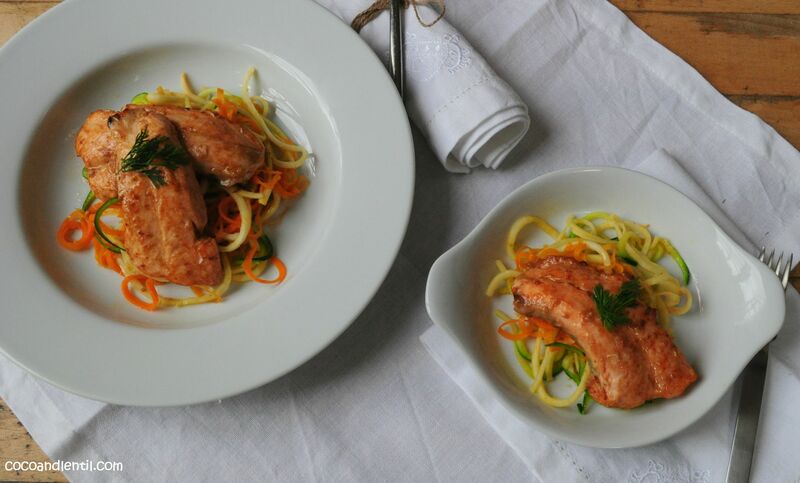 To serve, arrange the vegetables on a plate and place the salmon on top. Drizzle over the remaining glaze from the hot pan. This yummy recipe makes approximately 4 large and 2-3 little portions, but you’ll have to be quick before it’s gobbled up! 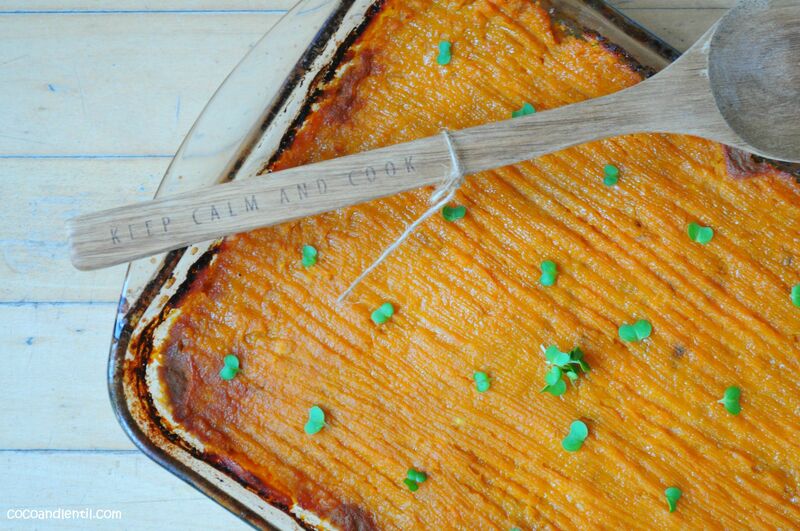 The pie can also be pureed to the desired consistency for younger tummies.